A large study links a significantly increased risk for developing dementia, including Alzheimer’s disease, to taking commonly used medications with anticholinergic effects at higher doses or for a longer time. 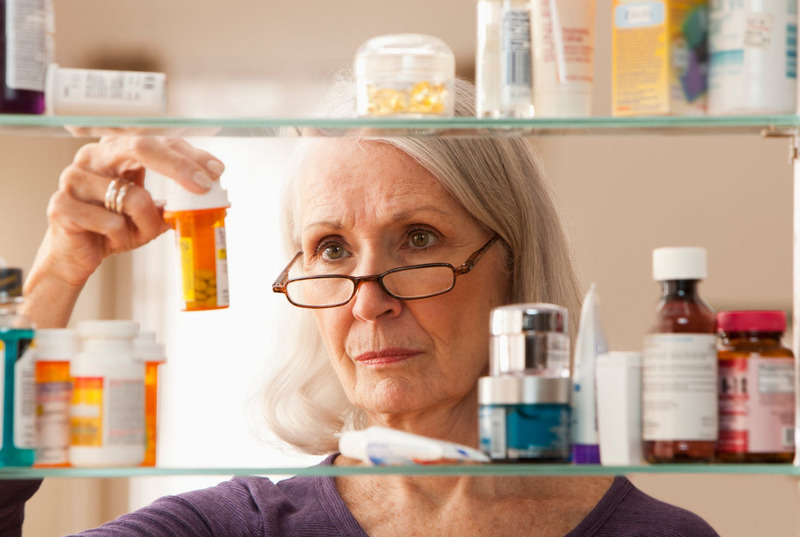 Many older people take these medications, which include nonprescription diphenhydramine (Benadryl) and related drugs. It’s been known for some time that memory or concentration problems in the elderly might be caused by common medications used to treat insomnia, anxiety, itching or allergies, according to a 2012 study reported by KurzweilAI. The study, however, used more rigorous methods, longer follow-up (more than seven years), and better assessment of medication use via pharmacy records (including substantial nonprescription use) to confirm this previously reported link. It is the first study to show a dose response: linking more risk for developing dementia to higher use of anticholinergic medications. And it is also the first to suggest that dementia risk linked to anticholinergic medications may persist and may not be reversible — even years after people stop taking these drugs. The most common anticholinergic classes used by subjects in the study were tricyclic antidepressants, first-generation antihistamines, and bladder antimuscarinics. Anticholinergic effects happen because some medications block the neurotransmitter called acetylcholine in the brain and body, causing many side effects, including drowsiness, constipation, retaining urine, and dry mouth and eyes, said Shelly Gray, PharmD, MS, the first author of the report, which tracks nearly 3,500 Group Health seniors participating in the long-running Adult Changes in Thought (ACT). ACT is a joint Group Health–University of Washington (UW) study funded by the National Institute on Aging. “Older adults should be aware that many medications — including some available without a prescription, such as over-the-counter sleep aids — have strong anticholinergic effects,” she said. Seniors should “tell their health care providers about all their over-the-counter use,” she added. “But of course, no one should stop taking any therapy without consulting their health care provider,” said Dr. Gray, who is a professor, the vice chair of curriculum and instruction, and director of the geriatric pharmacy program at the UW School of Pharmacy. The most commonly used medications in the study were tricyclic antidepressants like doxepin (Sinequan), first-generation antihistamines like chlorpheniramine (Chlor-Trimeton), and antimuscarinics for bladder control like oxybutynin (Ditropan). The study estimated that people taking at least 10 mg/day of doxepin, 4 mg/day of chlorpheniramine, or 5 mg/day of oxybutynin for more than three years would be at greater risk for developing dementia. Gray said substitutes are available for the first two: a selective serotonin re-uptake inhibitor (SSRI) like citalopram (Celexa) or fluoxitene (Prozac) for depression and a second-generation antihistamine like loratadine (Claritin) for allergies. It’s harder to find alternative medications for urinary incontinence, but some behavioral changes can reduce this problem. Larson is the ACT principal investigator, vice president for research at Group Health, and executive director of Group Health Research Institute (GHRI). He is also a clinical professor of medicine at the UW School of Medicine and of health services at the UW School of Public Health. This work was supported by National Institute on Aging NIH grants and by the Branta Foundation.